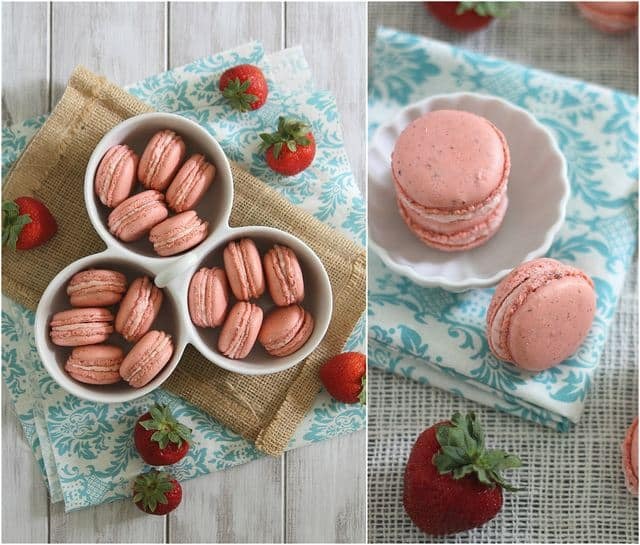 These strawberry rhubarb macarons are sweet, delicate and pretty in pink. So here we are with macarons again. Except this time they aren’t an epic failure. The only thing is, I can’t really take credit for how amazingly perfect these turned out. That all goes to Audra. We met at an event in NYC back in March and after seeing my miserable first attempt at macarons, she so kindly offered to haul her kitchen scale, pastry bags and candy thermometer up to the boonies and make a day of macaron baking so I could redeem myself. And while clearly these allow me to save some face in the world of macarons on the blog, reality is that I’m pretty sure if left to my own devices to attempt these again, we’d be looking at feetless pancake chips once more. That’s when I let Audra takeover and made us grilled cheese for lunch instead. Panini makers I can handle, scales, precise egg white separation and pastry bags….uh, not so much. After about 2 hours though (1 of which was solely spent sifting stubbornly course almond flour in the world’s dumbest sifter), the first batch went in and 15 excruciating minutes later, we finally looked through the grease streaked door of my oven to find FEET! Glorious pink, spongy looking feet with perfectly smooth tops. Jumping, screaming and clapping may have occurred. We actually made a strawberry rhubarb compote recipe of Audra’s that we were going to fill these with initially. It tasted absolutely delicious and the bright red color really would’ve popped sandwiched between the light pink cookies, but compote is a bit too runny when it comes to staying put between two cookie shells that you want to play around with for an hour taking pictures of. So we decided to make an impromptu buttercream with a bit of the compote mixed in. The strawberry rhubarb flavor still comes through but you get a much stiffer filling that works a lot better for macaron purposes. If I wasn’t taking pictures of these though, I totally would’ve gone the compote route. I’ve always found buttercream to be borderline too sweet, no matter what it’s on or in. Fruit > butter for me. So 5 hours, one disastrous kitchen and many blog prop setups later, I can now claim redemption over these pesky little french cookies. In the future however, I’m thinking they may just be worth their stupid price tag in the bakery. 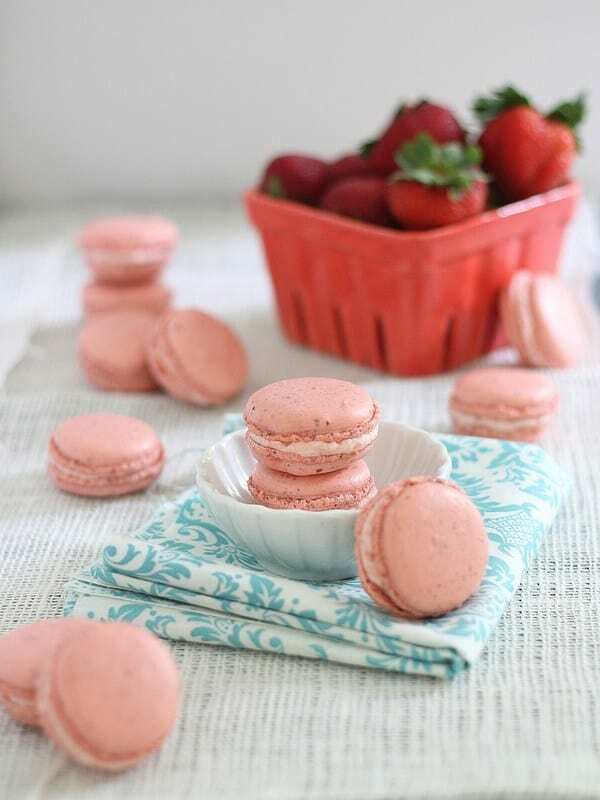 I’m posting Audra’s recipe for the macarons below with her permission, but I highly recommend reading her post about them here because she has a bunch of FAQs and way more detailed info from the class she took in Paris this spring. Plus, her blog is called The Baker Chick, I think you should definitely be taking her advice when it comes to macarons, not mine. 300 grams almond meal (or ground blanched almonds) sifted. In a large bowl, whisk together the sifted almond meal and powdered sugar- breaking up any lumps or large bits. Meanwhile, place the other 110 g of egg whites into the bowl of a stand mixer fitted with a whisk attachment. Leave it be while you make the sugar syrup. In a small saucepan, combine the sugar and water and stir together until dissolved. Clip a candy thermometer to the side of the pan. When the syrup reaches 225 degrees F- turn the stand mixer on high and start whisking the eggs. You want them to be at soft peak stage, so as soon as they are, turn the speed to low. The egg whites can wait for the syrup- but once the syrup is ready- it cannot wait. Add 1/2 of the meringue to the almond mixture, and gently fold it in until combined and smooth. Gradually add the rest of the meringue until batter is smooth and it almost ribbons off the spoon. Add gel coloring at this time and fold it in until the batter is smooth and shiny and totally ribbons of the spoon. Prepare baking sheets with parchment paper. If your oven has a strong fan- you may want to pipe dots of batter onto the corners to stick the parchment down. Pipe small rounds with the bag perpendicular to the baking sheet. Let the piped macarons sit out until a trace of a shell is formed- 20-30 minutes will do- maybe less. This helps keep their shape while baking. Bake for about 15 minutes. To test if done- open the oven and wiggle the top of a shell back and forth. If it's super wiggly they need more time. Perfect macs will be just a little wiggly- but overall firm. Macarons taste best when "ripened" in the fridge for 24-48 hours, but can last in the fridge air-tight for up to a week or two. Combine butter & sugar in a stand mixer fitted with the paddle attachment. Mix on medium-high speed until combined. Add the strawberry rhubarb compote 1 tablespoon at a time with the mixer on low speed to make sure the filling doesn't get too runny. You want to add as much compote for flavor as possible while still keeping a butter cream consistency. Scoop the filling into a pastry bag and pipe onto a cooled macaron shell. Place another macaron shell on top and gently press down to sandwich the cookies together. Macaron recipe from The Baker Chick with permission. G’day! KNOW first hand how challenging macarons can be! LOVE your photos and recipe! I’ve not been game to try making macaroons yet but those look amazing. We are having a french party in a month so I really should be starting to try french baking dishes so I can master them in time for the party. They are beuatiful! Love that pale pink colour and really like the idea of the strawberry/rhubarb filling. OOOooooohhh!!! I’m still to afraid to try macarons, but I’d be GLAD to come over and help you eat these cuties! Congrats on successfully making macarons with feet!! I still haven’t made these on my own since I took the class :-X I’m too scurred. Plus then I’d have to read that chicken-scratch recipe I wrote all over when I took the class (the one I sent you) and deciphering that mess alone will probably taken an hour. So glad you were able to make them! The class I took was a three hour class, and it was fun, don’t get me wrong. I felt a huge sense of accomplishment when I left and had those cute little cookies to take home with me. However, it seemed like more trouble than it was worth and I’m more than happy paying $2 for a macron at the cafe down the street from my work. Congrats!! They look amazing! I’m with you on the buttercreme, the name alone makes my tummy quiver. When Ben asks me if paying $3 a macaron is worth it – I tell him yes, because my spending $3 is better than me spending 5 hours in the kitchen screaming, yelling and swearing up a storm – which inevitably means it gets taken out on him. So uh, yeah duh it’s worth it. I’m so glad the stars finally aligned for you. Oh man your failure post made me laugh so hard! I made so many of the same mistakes you did when I made them. Didnt realize wax paper doesnt work either… had THE same result! Major fail. I really need to attempt them again but way too nervous about it. Do you think Audra would come to Vancouver to help me?? ;) These look perfect though! Can you send a batch this way? These are SO gorgeous, Gina! I love the flavor! Great job. Gorgeous!!! I’ll take 27, please?!! These look great. I still haven’t made any macarons yet and just might need you and Audra to come help me. This is pretty weird timing because I JUST made a failed batch of macarons yesterday. It was my third try! Maybe 4th time is a charm? You’ve given me hope to try again! Oh I could have used these delightful looking macarons at a weekend pot-luck as it was everything small or bite size theme :) we had turkey sliders, mini-fish taco’s, half sized veggie kabobs. Thanks for the great recipe. Absolutely gorgeous! 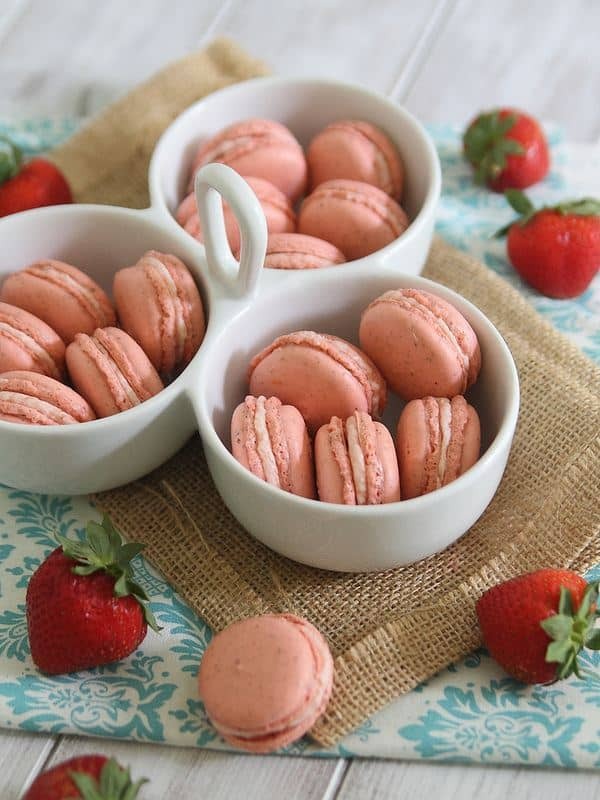 I love the strawberry rhubarb macarons you made too. 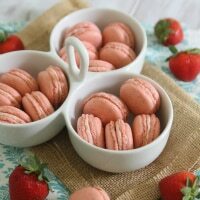 Lets bring macarons to Maine? They are probably my favorite thing to bake. I feel like a rock star when I see those perfect feet. I spent my entire summer last year perfecting them. They are finicky bastards, I too had many ruined batches. So glad this attempt went smoothly and that you didn’t give up. Macarons are the best! i love macarons. the strawberry rhubarb was a great idea! What a fun day. and what BEAUTIFUL macarons!! Yum!! Ok … so, I’m the girl (ok, woman-who-refuses-to-believe-she-is-in-her-30s) who left a big ol’ long comment on the pancake chip macaron post. Yay … maybe I should try the Italian Meringue method next instead of another French batch. Finicky french. Pingback: Friday Favorites: The Rhubarb Edition. | there's no place like gnome.